This stunning and well appointed ''Preserve'' model is located on a premium lot, built in 2017 and still under Pulte warranty. Your gorgeous new home has been meticulously maintained and every imaginable detail, option and upgrade is in place for your consideration starting with the beautiful chefs kitchen with stainless appliances, true staggered Chef Lux cabinet layout w/crown molding, soft close cabinets and roll-outs, cabinet knobs, quartz counter tops, tile backsplash, breakfast bar, pendant lighting, gas cooktop, wet bar and R/O system. No expense was spared as the home boasts beautiful upgraded tile and carpet, barn doors leading to office/den, water softener, Pella storm door and Larson two-way screen to utility door, ceiling fans, Solar savings and a golf cart garage... 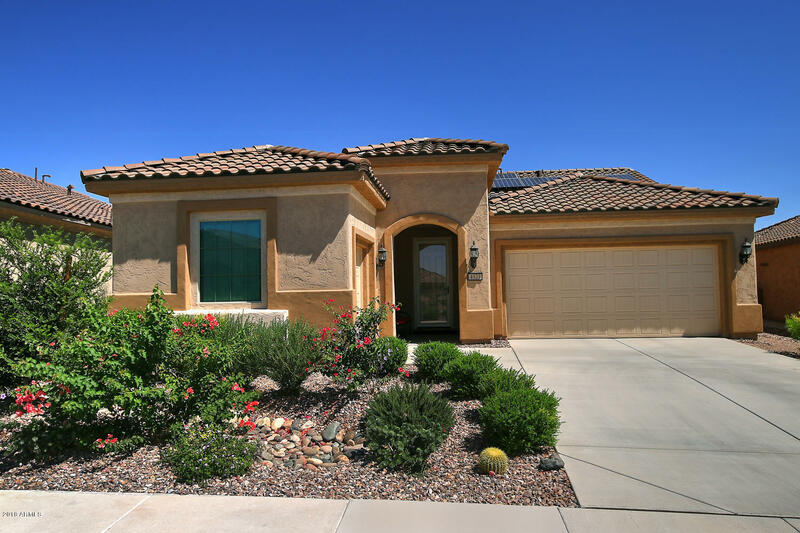 Some additional features of this gorgeous home include a bay window in master bedroom with an access door leading to the back patio and the master en-suite offers a his/hers vanity, walk-in closet and a very large walk-in shower. The home has been equipped with upgraded lighting fixtures, switches and outlets, tankless hot water heater, window coverings and laundry cabinets w/sink. The fenced backyard is an entertainers dream with a built-in gas fireplace to snuggle-up to, artificial grass, landscape lighting and a privacy wall without neighbors directly behind you. A MUST SEE HOME! Enjoy our newly built Anthem Grille, The Poston Butte Golf Club, a learning center and all the festivities, activities and amenities a Sun City community has to offer. Remember you are buying a lifestyle that goes beyond the homes property lines.